The Baroque Churches of the Philippines refers to four Spanish-era churches in the Philippines designated by UNESCO as a World Heritage Site in 1993. On August 15, 1993, UNESCO nominated Church of San Agustin in Manila, Church of La Nuestra Señora de la Asuncion in Santa Maria, Ilocos Sur, Church of San Agustin in Paoay, Ilocos Norte, and Church of Santo Tomas de Villanueva in Miag-ao, Iloilo. The Spanish had been the greatest power in the world during the late fifteenth to early seventeenth centuries. They, together with the Portuguese, ventured over vast stretches of ocean to reach new countries. Ferdinand Magellan discovered the Philippines for Spain in 1521. The Baroque Churches of the Philippines reveal evidence of the Spanish colonial effort in the Philippines. Spain's government and church worked closely with the Church of Rome, Catholicism. The Baroque churches of the Philippines have a similar design to the Spanish churches in America. They have the appearance of a fortress. Spain sought to protect itself from the native peoples (who had killed Ferdinand Magellan) and from the Muslims in the south. The formidable appearance outside the Church buildings hide the remarkable beauty and spirituality inside. The Spanish faced another challenge constructing huge Churches in the Philippines; earthquakes. Situated in the same Circle of Fire as Japan, the Philippines suffers from catastrophic earthquakes. The Spanish church architects allowed for them by creating a strong buttress design. The prominent buttresses helped to protect the massive church buildings. Spanish culture and civilization played a major role in shaping culture in the Philippines during the sixteenth through the nineteenth centuries. The Baroque Churches of the Philippines stand as a testimony of that influence. The Baroque Churches have been at the forefront of Philippine history since their construction in the 1500s. During the time of Spanish colonial rule, the Church and State worked hand in glove. They had served the Catholic church in the archipelago and as the political backbone of Spanish colonial rule. The unique design of the churches reflects the integration of Spanish and Latin American architecture to indigenous architecture of the Philippines, including a fusion with Chinese style. The Church's political power of that period manifests in the architecture. They had been designed to withstand attacks during revolts and rebellions, giving the Churches the appearance of fortresses. The blending of religion and military portrays the manner Spain saw its situation in the Philippines. The Church of La Nuestra Señora de la Asuncion, located on top of a hill, served as a citadel during times of crisis, providing the best example of the blend of purposes in the architecture. Church of Santo Tomas de Villanueva withstood the occasional attacks from Muslims coming from the south. The Philippines resides withing the Pacific Ring of Fire, calling for structures that could withstand the tremendous earthquakes that rock the region. Powerful buttresses and foundations gave the churches the support they needed to survive earthquakes intact. Although occasionally damaged seriously, the Church restored them each time. The Church of San Agustin has the most imposing of those buttresses, while the Church of San Agustin, Manila, the only structure in Intramuros (the southern district of Manila) to survive World War II, demonstrates the best example of the strength of that architecture. The unique architectural style became known as Earthquake Baroque. The The Order of St. Augustine built the Church of San Agustin located inside the historic walled city of Intramuros in Manila. Completed by 1607, The Church of San Agustine constitutes the oldest church building in the Philippines. No other surviving building in the Philippines has been claimed to pre-date San Aguustin Church. In 1993, San Agustin Church joined three other Philippine churches constructed during during the Spanish colonial period to received UNESCO World Heritage Site status. The Philippine government had named the site a National Historical Landmark in 1976. Two Augustinian churches had been built on the site before the present structure. The original Church of San Agustin had been the first religious structure constructed by the Spaniards on the island of Luzon. Constructed of bamboo and nipa in 1571, fire destroyed the Church in December, 1574 during the Limahong invasion of Manila. The Augustinians rebuilt the church out of wood on the same site. A fire that started when a candle set ablaze the drapes of the funeral bier during the interment of the Spanish Governor-General Gonzalo Ronquillo de Peñalosa, destroyed the building a second time in February, 1583. The Augustinians decided to rebuild the church using stone, and to construct an adjacent monastery as well. Construction began in 1586, following the design of Juan Macias. The structure had been built using hewn adobe stones quarried from Meycauayan, Binangonan, and San Mateo, Rizal. The work proceeded slowly due to the lack of funds and materials, as well as the relative scarcity of stone artisans. The monastery became operational in 1604, the church formally declared completed on January 19, 1607, receiving the name St. Paul of Manila. The Augustinians officially acknowledged Macias, who had died before the completion of the church, as the builder of the edifice. British forces, which occupied Manila in 1762, during the Seven Years' War, looted the Church San Agustin. The structure withstood major earthquakes that struck Manila in 1645, 1754, 1852, 1863, and 1880. In 1854, architect Luciano Oliver supervised renovation the church. On August 18, 1898, Spanish Governor-General Fermin Jaudenes prepared the terms for the surrender of Manila to the United States of America following the Spanish-American War at the church. During the Japanese occupation of the Philippines during World War II, the Church of San Agustin became a concentration camp for prisoners. Japanese soldiers held hundreds of Intramuros residents and clergy hostage in the church during the final days of the Battle of Manila; many of the hostages died during the three-week long battle. The church itself survived the bombardment of Intramuros by American and Filipino forces with only its roof destroyed, the only one of the seven churches in the walled city to remain standing. The adjacent monastery suffered total destruction. architect Angel Nakpil designed the rebuilding of the structure as a museum in the 1970s as a museum. 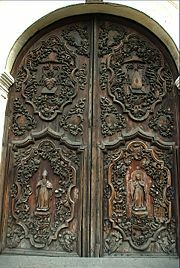 The ornately carved main door of Church of San Agustin. The Church of San Augustín measures 67.15 meters long and 24.93 meters wide. The elliptical foundation has enabled the structure to withstand the numerous earthquakes that destroyed many other Manila churches. The design derived from Augustinian churches built in Mexico, representing almost an exact copy of Puebla Cathedral in Puebla, Mexico. The facade, unassuming and criticized as "lacking grace and charm," has notable baroque touches, especially the ornate carvings on its wooden doors. Several granite sculptures of lions, which had been gifted by Chinese converts to Catholicism, grace the church courtyard. The church interior takes the form of a Latin cross. The church has fourteen side chapels and a trompe-l'oeil ceiling painted in 1875, by Italian artists Cesare Alberoni and Giovanni Dibella. Hand-carved seventeenth century seats of molave, a beautiful tropical hardwood, furnish the choir loft. The church contains the tomb of Spanish conquistadors Miguel López de Legazpi, Juan de Salcedo, and Martín de Goiti, as well as several early Spanish Governors-General and archbishops. Their bones lay in a communal vault near the main altar. The painter Juan Luna, and the statesmen Pedro A. Paterno and Trinidad Pardo de Tavera number among the hundreds of laypersons whose remains have been buried within the church. The Church of San Agustin Church hosts an image of Our Lady of Consolation (Nuestra Senora de Consolacion y Correa), canonically crowned by Manila Archbishop Cardinal Jaime Sin in 2000. Founded in 1765, the mission of Santa Maria became one of the most successful Augustine missions in the Philippines. From its site on in Luzon, situated in a plain between sea and mountains, missionaries Christianized throughout the northern parts of the Philippine islands. The Church of La Nuestra Señora de las Asuncion marked a departure from the traditional Spanish church building. Rather than setting the town church in the central plaza, the Augustinian mission chose to build the church and convento on a hill. A formidable defensive wall surrounds the structure. The builders, taking cues from the topography of the hill, set convento parallel to the front of the cathedral while building the bell-tower at the center of the sanctuary wall. That showed an adaptation to Philippine-Hispanic architecture. The builders constructed the church and school with brick. A gigantic facade covers the main building. Ornamentation is conspicuously absent except for intricate designs on the entrances and buttresses. Legend says that the original chapel dedicated to the Blessed Virgin had been built at a site in the present day barrio of Bulbullala. The statue of the virgin enthroned in that small chapel, periodically disappeared and subsequently reappeared in a guava tree at the site of the present main altar of the church. A chapel and a tower had been built in 1810. Records also show that the bells for the tower arrived in 1811. In 1822, the convent and church were razed to the ground. After rebuilding, Father Bernardino Lago made Santa Maria a center of his missionary activities for the interior settlements. Newly arrived missionaries learned Ilokano psychology and perfected their knowledge of the Ilokano language in Santa Maria before they were sent to neighboring mission posts. The convent provided a retreat house for weary Augustinian missionaries from their intense apostolic labors, and for sickly or aging friars. Father Lago converted thousands, necessitating the establishment of the town of Nueva Coveta, the present town of Burgos, in 1831. In 1863, the church underwent remodeling. The sides of the knoll surrounding it, the convent and the tower, reinforced with huge stone boulders kept in place by mortar, a task which required exhaustive labor, lasting until 1871. Pal Kelman defined "earthquake Baroque" to designate a kind of architecture in Latin American designed to withstand earthquakes. The term has been applied to church buildings in the Philippines, the Church of San Agustin in Paoay reputed as the finest example. The outstanding feature of the church building, fourteen buttresses, line the enormous volute of the church building giving the sense of sturdiness and strength. The strength and sturdiness has been proven by withstanding many earthquakes. A less conspicuous feature of the church's strength lay in the use of coral stone blocks for building. Coral blocks have greater strength than brick or stone building materials. The huge bell tower, built fifty years after the main sanctuary, has also been constructed with coral bocks. The Miag-ao Church, built in 1786 by Spanish Augustinian missionaries, had been declared as part of the UNESCO World Heritage Site "Baroque Churches of the Philippines" in 1993. On the front facade, flanked by two watchtower belfries, the unique blending of Spanish and native influences manifests. A large coconut tree which reaches almost to the apex represents the central feature of the bas-relief facade. A integral part of the Philippine landscape, the coconut tree also the conveys local lore. According to an old Philippine legend, a loving mother left the coconut tree, a tree which sustained them for life, as her only bequest to her two children. The coconut tree appears as the "tree of life" on the church's facade. St. Christopher carries the Child Jesus on his shoulder clinging to the coconut tree. The other facades feature the daily life of Miagaowanons during the time, native flora and fauna, as well as native dress. The church and its watchtowers had been built with thick walls and secret passages to defend the town and its people against raids by the Moros. Indeed, defensive towers stand along the Iloilo coast, yet none equal the size of the Miag-ao. The defensive purpose of the Church led to the popular name Miag-ao Fortress Church. ↑ Alfonso Aluit, "By Sword and Fire: The Destruction of Manila in World War II 3 February-3 March 1945" (Philippines: National Commission for Culture and the Arts, 1994), p. 41. ↑ Benjamin Locsin Layug, "A Tourist Guide to Notable Philippine Churches." (Pasig City, Phillipines: New Day Publishers, 2007), p. 83. ↑ Heritage Conservation, San Agustin Church (Intramuros, Manila). Retrieved March 24, 2008. Aluit, Alfonso. By Sword and Fire: The Destruction of Manila in World War II 3 February-3 March 1945. Philippines: National Commission for Culture and the Arts, 1994. ISBN 971-8521-10-0. Layug, Benjamin Locsin. A Tourist Guide to Notable Philippine Churches. Pasig City, Phillipines: New Day Publishers, 2007. ISBN 971-8521-10-0. Torres, Jose Victor Z. Ciudad Murada: A Walk Through Historic Intramuros. Manila: Intramuros Administration & Vibal Publishing House, Inc., 2005. ISBN 971-07-2276-x. Nomination for the Extension of the Baroque Churches World Heritage Site. History of "Baroque Churches of the Philippines"
This page was last modified on 11 December 2016, at 19:55.